These Mahalo Dollars, which Calacanis first started distributing in his Q&A site Mahalo Answers, can be converted into real money at an exchange rate of 75 cents to the dollar or can be saved up to spend in Mahalo itself in the future. Calacanis saw all the activity that was happening on Mahalo Answers, which he says broke one million users last month, and wanted to bring that over to Mahalo proper. 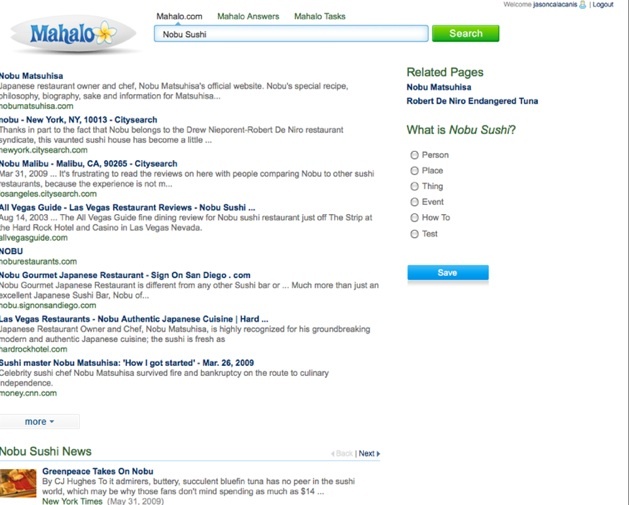 Now anyone can claim a topic and create a search results page around that topic or keyword. There is one editor per page and Mahalo will split the AdSense revenues 50/50 for any page he or she makes and maintains. A typical page could generate $20 to $50 a year. If you make 100 of those, that turns out to be some nice pocket change. The more pages you make, the more points you get and can climb from being a white belt to a black belt. With each new level, you get more privileges. At some point, members will be able to buy and sell pages they have claimed (for Mahalo Dollars, of course). In order to make page creation easier, Mahalo will now assist editors by turning up appropriate links, images, videos, news stories, questions and answers, and more. All you have to do is put in a search term, pick which elements should appear on the official topic page, and write up a short description. It is all driven by APIs in an attempt to bring the appropriate information to editor’s fingertips. 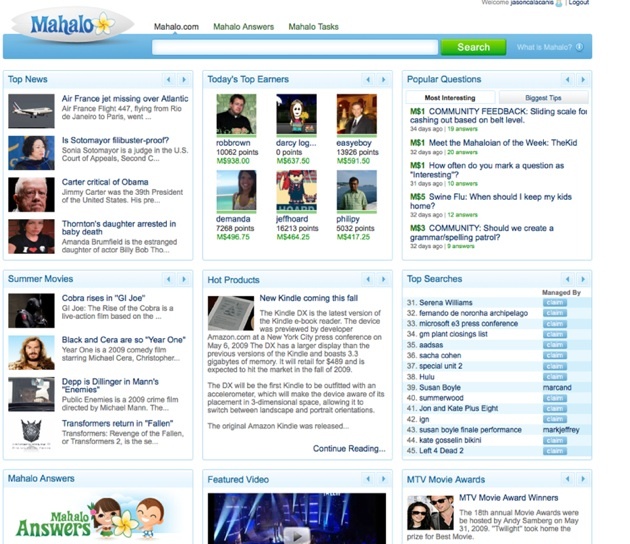 Mahalo needs to go from 100,000 topic pages to millions of them, and fast. It is using these semi-automated approaches to get there. Whether or not these will produce the best pages on any given topic remains to be seen. One problem I see is that claiming a topic and the associated revenues will be on a first-come, first serve basis. If someone comes along later with better domain expertise on, say, sushi (see screenshot below), he or she is out of luck. So there will be a bit of a land grab. With that, there is certainly a danger that people will shift from making spam pages to Mahalo pages. Calacanis dismisses this possibility. He notes that spammers will always be able to make more money on their own and that there are too many tripwires in Mahalo’s system to make it worth their while. Plus, Mahalo will yank any pages it deems too spammy. The bigger challenge for him is to get people to come to Mahalo on their own instead of through search engines. People who come from search engines tend to be drive-by traffic. They look at 1.5 pages then leave. People who come directly or through referring sites look at 4 to 5 pages per visit. Calacanis is doing a lot to get more people to come to his site. Now he needs to get them to stay.